Discussion in 'Autograph Collecting' started by Jedi_Joel, Jun 21, 2005. Congrats on all the recent replies! I'm hoping to hear from Jerry soon as well! 'Stick Fly' cast signed playbill including Dule Hill! Kevin Spacey - Signed all of my photos!! Rosemary Harris - Signed all of my photos!! Harry Connick Jr. - Sent me a signed photo - Just got this one today! WOW! Odds are in my favor yet again! lol. Received my 11th Hunger Games cast success, this time from the awesome Dayo Okeniyi who will be playing District 11 Tribute ‘Thresh’ in the upcoming film!! I knew this one was coming back, as Dayo himself replied to my Facebook comment a couple weeks ago saying he had gotten my letter and sent my items back. But I was still blown away by his response! 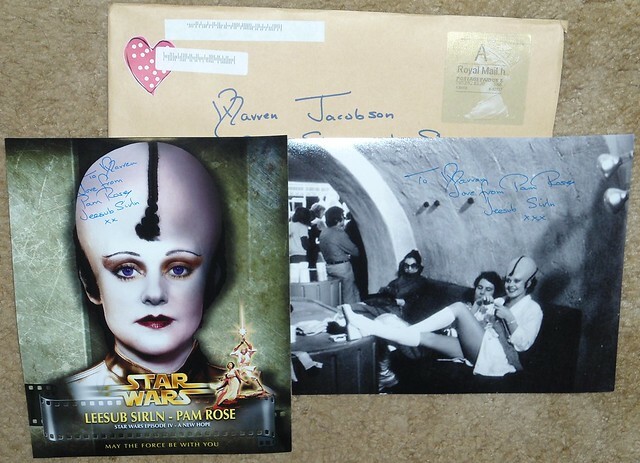 Dayo personalized and signed both my photos complete with the famous ‘odds’ quote as requested! And added his character to name to them as well. He also signed my custom Hunger Games card and wrote “This is the first fan mail I ever received and I will never forget it”!! How cool is that! He even took the time to fill out my Q&A card with some very awesome answers! Specially liked his answer to what he prefers the best when it comes to handwritten or typed letters from his fans. This also completes my District 11 Tributes – with Amandla Stenberg’s success earlier this year. Thanks Dayo! Dawn Wells - Signed my index cards and included a letter answering my questions! Carla Gugino - Signed all of my photos! Ed Harris - Signed my photos and index cards and included a letter answering my questions! Hector Elizondo - Signed all of my photos and included a long letter answering my questions!!! I've only receieved 2 replies since my last post. Cast signed playbill from 'Seminar' - Including Jeff Goldblum, Justin Long & Jerry O'Connell! Russell Johnson - Signed my index cards in just a week! Got 3 replies last week. Cast signed playbill from 'Sister Act', including Raven-Symone. Cast signed playbill from 'The Columnist', including John Lithgow and Boyd Gaines. Doris Roberts - Signed and personalized all of my photos!! Very happy as she's one of my favorite actresses!! Wow, it's been a long time since I've posted in here.. Received a lot of replies over the last couple months. Some of the highlights include: Richard Karn, Jonathan Pryce, Maggie Smith, Bernard Fox, Bob Newhart, Emma Roberts, John Hurt, Tim McGraw, Mandy Patinkin after a year and a half wait, Angela Lansbury on a mini poster, my photos signed and letters from Ed Asner, Paul Rudd, Alfred Molina and SIGOURNEY WEAVER!! Info and scans are on my website in my signature. I attended the Marilyn Manson/Rob Zombie concert in Dallas on Halloween night. Afterwards, I waited by the gate out back with others in hopes of snagging a few autographs. Sheri Moon Zombie came over and talked for a few minutes and signed for us. No one else came over while I was there. So...one sig added to the collection. Sheri was very nice and I know everyone there was very appreciative. 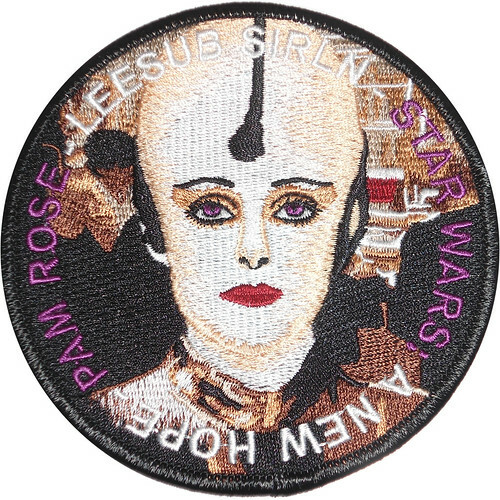 Got a patch and autographs from Pam Rose (Leesub Sirln in ANH). She sells autographs via her website, although I was able to work out a trade with her and sent her a Legion patch for her personal patch. She is on Facebook. Congrats on all your success. Nice turn-out. Diane Kruger (One of my most wanted!) Now only need Harvey Keitel for my National Treasure collection! Well October kinda sucked for me with only 2 replies, but November has been pretty decent. Karen Allen - The first of my custom Indiana Jones cards! Emma Bell - Included a nice letter answering my questions! As always, scans are on my startiger page, and now also on my brand new website!